I decided to take a triple dose of Ibuprofen last night to agressively address my lower ab and groin strain that I have been dealing with. To my surprise, I felt much better this morning. This made me optimistic about the 9 mile run I had scheduled for this afternoon. I had decided to rest yesterday in order to give my body more time to recover from the strain. 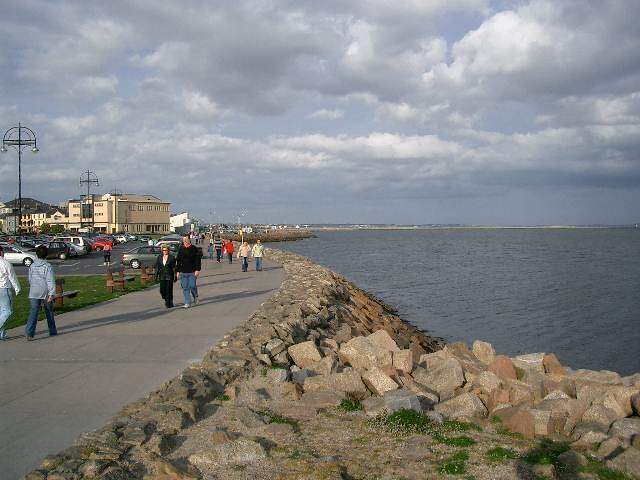 So this afternoon, I went for another run down towards and along the "Prom" In Galway/Salthill (see picture above) on the West coast of Ireland. It was fantastic weather when I took off from my hotel at 4pm. I picked up the pace a little early on to try to settle in at 8:30 minutes per mile. I felt pretty good, even though the strain is still there. I was nagging me just a little bit less today. People were out in masses today to enjoy the fourth straight day of sunshine and dry weather. If you have ever been to Ireland, you know how unusual and special that is. My run consisted of a little road running as well as some nice sections of trail between the beach/coast and the actual promenade. Lots of people were out running, walking or just laying out at the beach. Some brave souls even went for a swim in the Atlantic. Overall, I enjoyed this training run very much. I am now looking forward to tomorrow's run in Ireland's capital, Dublin.